Complete mass of NEA 001. 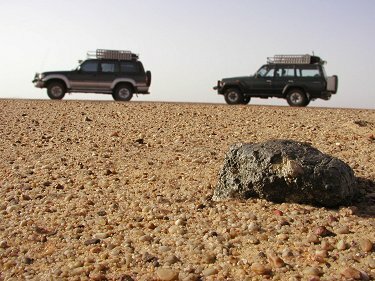 A brownish gray stone weighing 262 g was found by a prospector in northern Sudan near the Libya/Egypt/Sudan boundary in 2002 April. 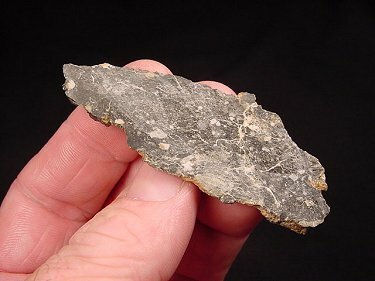 Fusion crust is absent, fresh surface is gray to dark gray, and terrestrial alteration products are present at the meteorite edges and in penetrating cracks and veins. Classification and mineralogy (J. Haloda and P. Týcová, PCU): a clast-rich anorthositic regolith breccia containing numerous mineral fragments and lithic clasts embedded in a well-consolidated microcrystalline impact melt matrix. Lithic clasts (up to 1 cm in size) are mainly of anorthositic lithologies; impact-melt breccias of anorthositic composition are abundant and show commonly breccia-in-breccia textures. Fragments of primary igneous rocks of anorthositic to gabbroic composition are common, containing plagioclase An95.1-97.2, low-Ca pyroxene En46-65 Wo2.1-5 and high-Ca pyroxene En35-48Wo37-44 and rare olivine Fo79.4. Sparse clasts of mare basalts (consisting of pigeonite+anorthite+accessory ilmenite), and glass fragments and spherules are present. 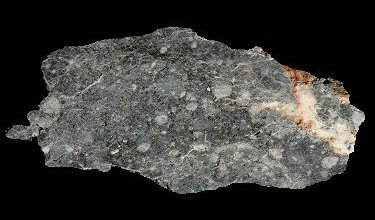 Mineral fragments are of various composition: feldspar, An92-99; orthopyroxene, Wo2-4En49-80; clinopyroxene, Wo9-39En50-87; olivine, Fo48-82 (Fe/Mn 93-100 atom%); accessory minerals are Mg-Al spinel, chromite, ilmenite (2-5 wt% MgO), troilite, FeNi metal and silica. Several pyroxene grains have marginal symplectitic intergrowths of fayalite+hedenbergite+silica after former pyroxferroite. Composition of the impact-melt matrix is (wt%): SiO2 = 45.7, Al2O3 = 24.1, FeO = 7.2, MgO = 7.4, CaO = 14.6, Na2O = 0.5, TiO2 = 0.5. Secondary calcite, barite, gypsum and Fe hydroxides occur in cracks. Specimens: type specimen, 20 g, and one polished thin section, PCU; 5.8 g, and one polished thin section, UWS; 59.66 g, ROM; 60 g, xHupé; 9.7 g, Gregory; main mass with finder. Snape J. F., Joy K. H., and Crawford I. A.
Meteoritics & Planetary Science 46, 1288-1312. (2009) A trace-element investigation of lunar meteorite Northeast Africa 001 (abstract). Snape J. F., Joy K. H., Crawford I. A., and Beard A. D.
(2008) A petrographic study of lunar meteorite Northeast Africa 001 (abstract). (2008) Using composition to assess pairing relationships among lunaites. Goldschmidt Conference Abstracts 2008, Geochimica et Cosmochimica Acta 72, 12S, p. A492. Haloda J., Irving A. J., and Týcová P.
An anorthositic regolith breccia with mixed highland/mare components (abstract). (2005) Lunar geochemistry as told by lunar meteorites. Chemie der Erde 65, 297�346. Meteorite Hills 01210, Northeast Africa 001, and Northwest Africa 3136 (abstract). Complete slice of NEA 001. NEA 001 mass in situ.